Whimsy Canvas Tutorial and Kits - & Give-Away! basic class for a small and easy piece that will open a whole new world of crafting for you! And....now you order the full Kit, which includes all the supplies, as well. You can purchase the entire kit for only $25.95 and it includes FREE SHIPPING! Please email me at erikaerin2001@yahoo.com with any questions. One lucky winner will receive a FREE Kit! Leave a comment on this post for your chance at winning a FREE kit! I'll pick the winner with the random number generator on Monday (11/9) at 11 am Eastern Time and announce them here! Spread the groovy love and send your friends over to enter, too! And while you're at it, if you haven't already signed up for my mailing list (which is that little box ALL THE WAY at the top of my blog, on the left side of my side bar), pop your email address into that box so that you don't miss out on any of the fun stuff I have going on outside of this blog, along with newsletters and more! It's been a while since my last Groovy Give-Away, so I decided it was long overdue! So.........what am I giving away this time? Ooooooh, it's a good one. I promise! I just recently finished up the Paper Bag Book Trilogy Tutorial CDs and have sent out all the CDs that have been ordered......and thought it would be a nice prize to give away one of these awesome CDs. Some lucky winner of this give-away will get the CD for their very own! There are 3 whole tutorials for 3 different styles of paper bag books on this CD.....great for making gifts, doing camps, great as mother/daughter projects.....etc. And they all use paper bags of some kind! So......what do you need to do to enter this Groovy Give-Away? I'll pick the winner with the random number generator on Tuesday (4/8) at 9 pm Eastern Time and announce the winner here! Spread the groovy love and send your friends over to enter, too! And while you're at it, if you haven't already signed up for my mailing list (which is that little box ALL THE WAY at the top of my blog, right under my picture), pop your email address into that box so that you don't miss out on any of the fun stuff I have going on outside of this blog, along with newsletters and more! 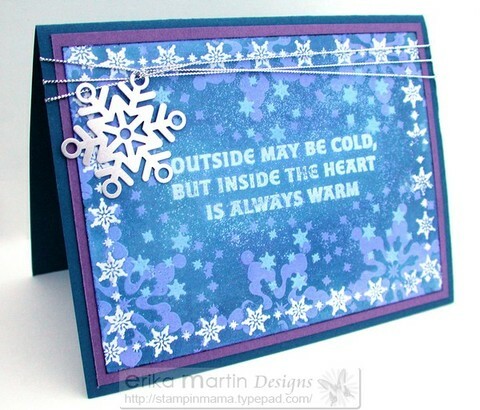 I just recently updated the Stampin' Mama Tutorial Program page of my blog with the five latest tutorials. You can find them ALL the way near the bottom of the page. Issues 30-34. Please let me know if you have any questions. I'm always glad to help! I've been wanting to do something with my Kitchen Sink Stamps Snow Flurry set for the past couple of days, especially since we woke up Monday morning to find about 3+ inches of snow on the ground (and got another inch during the course of the day). 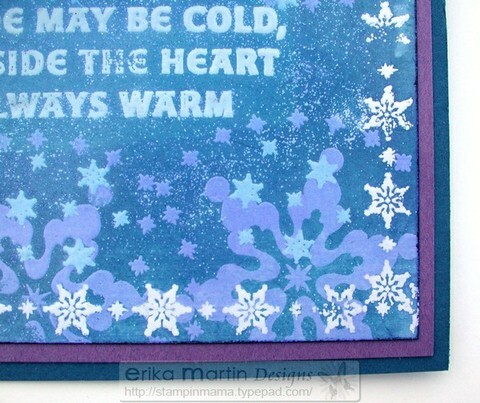 I had plans to use the Layered Emboss Resist technique (which is Issue 17 from the Stampin' Mama Tutorial Program) and wanted to create something with blues and purples. This is a technique that I created while playing around with glossy cardstock one day and the effects you can get with this technique are just eye popping! I ended up using one more color than I normally do and was unsure as to how it would turn out. To be honest, for about 5 seconds, I was downright scared when I used the 5th color, but it all turned out beautifully and all is right in this Stampin' Mama's twisted stamping world. I know I said that I would try to stay away from the blues for a while, but I just couldn't help myself. Hey, at least I added in a little purple to change things up a little. Yes, yes, I KNOW it's not that far off from blue, but it works for me and was the loop hole I needed. The Snow Flurry set is a fun one to work with. I'm thinking it's going to be awesome to use in my scrapbooks. My daughter loves the snow and insists on making snow angels while waiting for the bus in the morning. And subsequently, her snow angels all have backpacks, too. I have quite a few pictures of her out in the snow that need to find their way into scrapbooks eventually and the small snowflake border will work really well as a page border.....or even to use to make frames around pictures or journaling blocks. Once again, I dug into my hoarded supplies and used one of the metal snowflakes from Making Memories. What in the world is WRONG with me? I'm digging into those hoarded supplies more and more as time goes on. I think I might be turning a new leaf. Or finally growing up. Or something along those insane lines. Now just watch.....I may have used the hoarded snowflake charm, but I'll most likely just hoard the finished card because I won't be able to part with the snowflake. Speaking of hoarded supplies, I also used some of the Silver Cord that Stampin' Up retired back in July of this year. I've been holding on to the last of it in my stash, not wanting to use it too fast. I decided to go all out today and actually wrapped the front of the card 3 TIMES!!! Woohoo! Look at me.....livin' on the edge! A snowflake charm AND my silver cord (3 times around, to boot)! I so wish that SU would bring the cord back. That's my wish for the new catalog (among a few other things). The elastic cord just isn't quite the same, although it IS nice for tags and such. I had the fleeting thought to add Dazzling Diamonds glitter, but then thought better of it. I didn't want to go OVER the edge. Time to Celebrate! A Groovy Give-Away in honor of 400 posts! Wow! Do I really talk that much? Have I really posted a total of 400 posts in less than a year and a half??? It appears so. I wanted to put this give-away up on Friday of last week, but it was one of those things that got buried under the MOUND of Christmas cards and kits I was getting ready to go out in today's mail. I appreciate you all being so patient and understanding. I told you I would make this give away worth it! So....what's the loot in this awesome "Celebrate 400 posts" give-away? 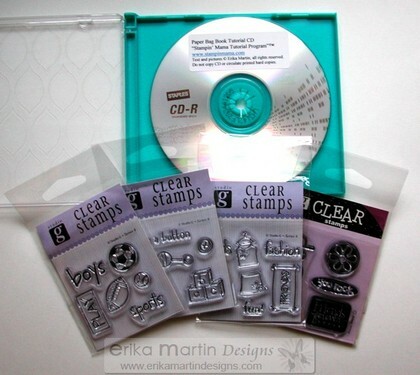 * 4 packages of fun clear stamps....themes include boys, girls, baby and funky. This is a prize package totaling $36!!! Talk about a GROOVY GIVE-AWAY! I want to thank you all for reading and visiting my blog. Thank you for the wonderful comments and emails you send me. Thank you for the encouragement and the suggestions. I enjoy every minute of what I do and am so glad I can share it with you all! Here's your chance to ask me anything you like. Leave a comment on this post with any question(s) you like. It can be about anything at all. Stamping, scrapbooking, techniques, life in general, personal stuff....ask away! I'm going to plan on doing a "Questions and Answers" post every Sunday. I'll pick a name with the random number generator on Thursday (12/6) at 11 am Eastern Time and announce the winner here! 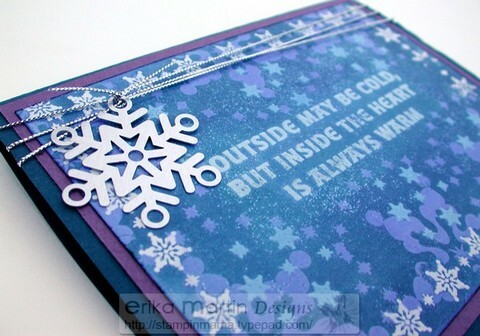 Update on Winter Bright Kits....and Tutorial CDs are still available! For those of you that are still waiting on the Winter Bright Extravaganza Kits and Tutorial CDs, the last batch went out in today's mail. I put a round in the mail at the beginning of last week, another round on Saturday, yesterday and today, as well. I've loved all the positive responses I've gotten back so far.....keep them coming! I love to get feedback, as I'm always striving to make the kits and CDs the best possible! I have literally spent HOURS burning CDs, cutting cardstock and assembling kits....packaging and mailing....and for the next upcoming release (which will be out in about 4 weeks time.....I'm still working on putting the projects together and figuring out what to include in my newest kit and CD), I have a plan in action to have these kits go out even faster! I want to make sure you're all getting these CDs and kits as quickly as possible so that you can let your creativity loose and start making these awesome projects right away! I'm thrilled to the gills that you've all been loving what you see so far! For those of you that are new to my blog, or if you wanted to get in on the kits and CDs but haven't gotten around to it, yet......I have great news! Even though To-Go kits were only for a limited time, the CDs are still available! Please don't hesitate to ask me any questions you might have about these great CDs. Just a quick update that the August and September "Stamp Class in your Inbox" are updated and on my blog. You can check them out by going here: "Stamp Class in your Inbox"
Have you ever wanted to try one Stampin' UP's Simply Scrappin' Kits but didn't quite know what to do with it? Are you not a scrapbooker but want to make quick and easy projects without having to worry about coordinating colors, products and accessories? Then I have the perfect answer for you! 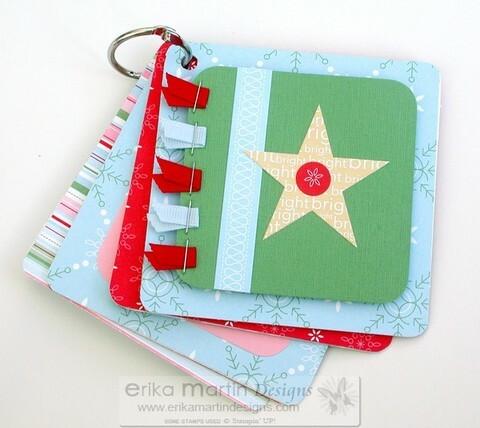 "Winter Bright Project Extravaganza To-Go Kits and Tutorial CDs"
Make 12 awesome projects from one awesome kit.....projects that go WAY beyond just scrapbooking! Or.....Learn how to make the 12 projects using the "Tutorial CD." You can check out all the details (and a couple more project sneak peeks) on this JUST RELEASED To-Go Kit and Tutorial CD by clicking here ---> "Winter Bright Project Extravaganza To-Go Kits and Tutorial CDs"
Question and Answer time :) The "Stampin' Mama Tutorial Program"
Back at the end of August, I did my first "Groovy Give-Away Friday." For that give-away, I told you all that you could ask me any questions you wanted. Wow.....what great questions I got and I'm still working on answering them all in my posts....it'll take a little while as the questions were so diverse and I'm looking to find ways to intersperse them into my posts. How does one subscribe so as to get to the tutorials? Well.......I've been working on getting a page up on my blog that tells you all about it. 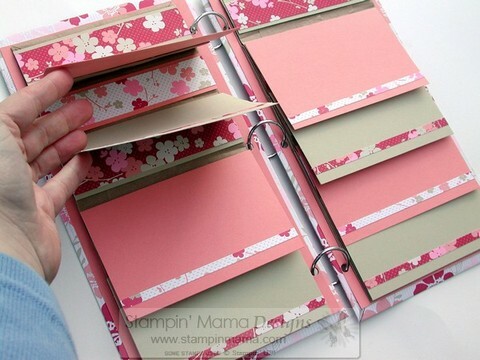 In the meantime, I have already put out 19 Issues of the "Stampin' Mama Tutorial Program" and you can check out sneak peek pictures of all of those issues. To see information about this great program, click here --------> The "Stampin' Mama Tutorial Program"
This page will tell you everything you need to know about the program, as well as give you the option to sign up and take part in the program. There's also the option to get the back issues that I've put out. Please don't hesitate to email me to ask any questions you may have about this program.